Deka Unigy I sealed lead-acid batteries are available as AVR (absorbed valve regulated) and GVR (gel valve regulated) technology for virtually any application demand. Both are UL recognized components and are made in the U.S.A. with individually tank-formed plates for optimized uniformity of cell-to-cell voltages. 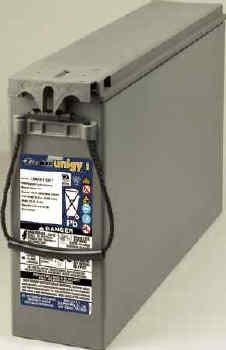  All batteries meet or exceed IEEE 485 and Telcordia capacity requirements.